What are the significant numbers in your life? For me it's birthdates and anniversaries although I always say my lucky number is 13. To be honest though I love seeing and using numbers in art and I often use them in my projects. 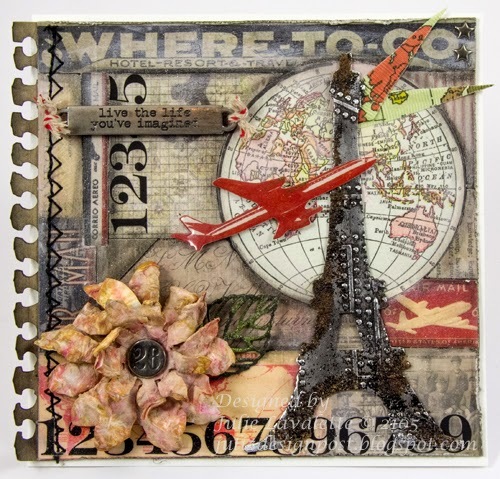 So thinking about your project to enter - although you do not have to use Tim products so many of the things he produces have numbers on - papers, stamps, remnant rubs, stencils and idea-ology to name a few. 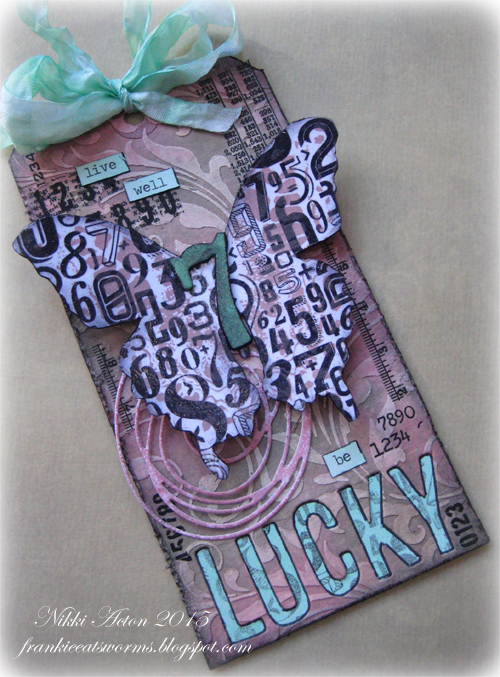 Choose how to incorporate your significant numbers, it could be birthdays, age, anniversary or the lucky ones! 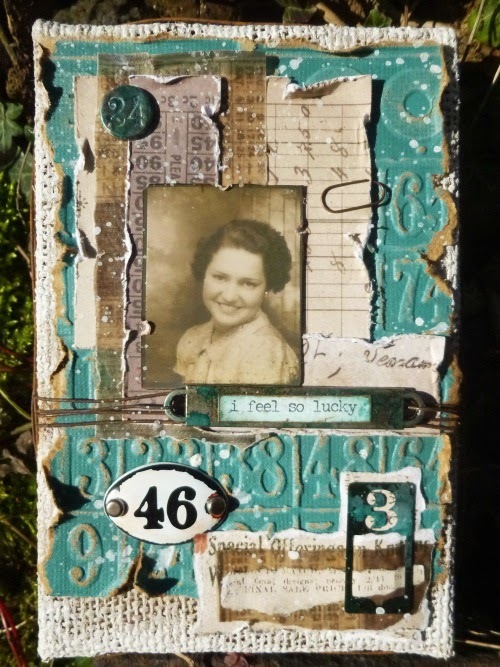 Use them on any project you wish and tell us how they are important to you; we would like to see one of those vintage, shabby, mixed media, journaling projects that has a Tim Holtz influence. Please let us know what that influence is, if it's not evident, so that we can consider you for the winner and pinworthies mentions. Here are the amazing samples from the ever talented Creative Guides to help inspire you. I am very lucky to have four very special friends and when we are together we refer to ourselves as the Famous Five - poor Enid Blyton would not recognise this new adventurous bunch! I have used the new Cracked Pistachio Distress Ink (I love it!) and loads of number rub ons. My tag is quite simply inspired by all the Tim products which contain a number and of course the five of us. Join me over at Live the Dream if you want to see more details. The timing on this challenge couldn't have been better. I have a very special number, which is 70. A few days ago we celebrated my parents 70th wedding anniversary. 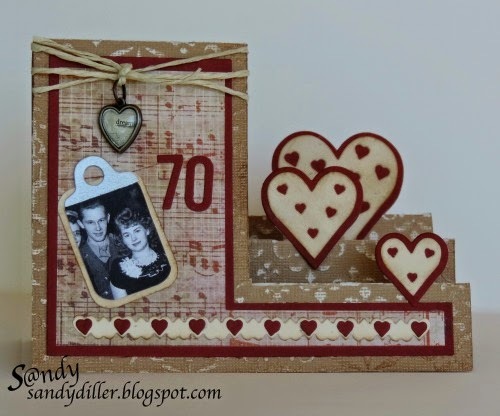 You can see Tim's influence here with the Vintage Photo edging, his twine and heart charm. 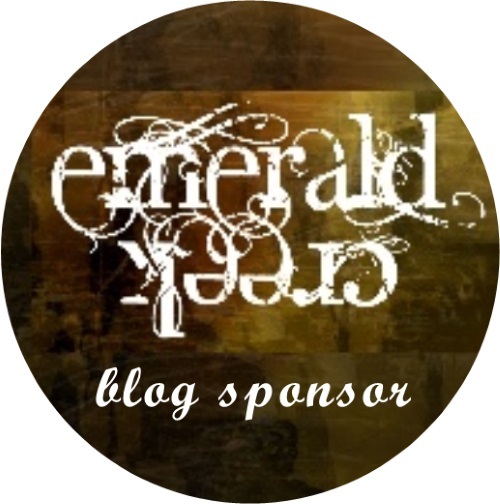 Hope you will stop by my blog to see more details. The sun is out and I'm in a good mood, so this burlap panel celebrates my own personal special numbers with a big smile courtesy of one of the new Photobooth photos and the perfect phrase from the new Small Talk stickers. Come over to Words and Pictures to discover the significance of my chosen numbers and see some close-ups! 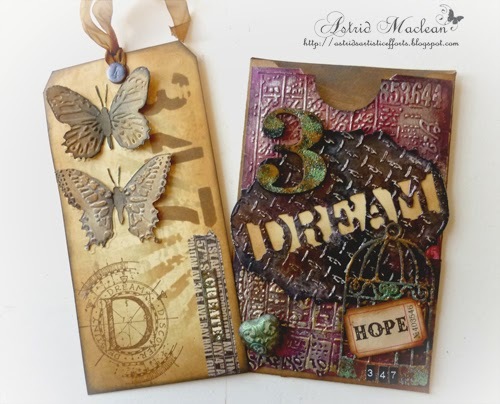 I have incorporated some of the newly released Tim Holtz products in my lucky tag today including the gorgeous cracked pistachio distress ink. Do hop over to Addicted to Art to see the details. My eldest Daughter recently relocated to London to follow her dream working as Long Haul Cabin Crew. With this in mind I decided to make her Birthday card incorporating Tim's style of background from his February tag along with techniques she admires when I make something. Please pop over HERE to my blog for full tutorial. I have made a lucky number plaque for today's challenge - you can see which one it is. 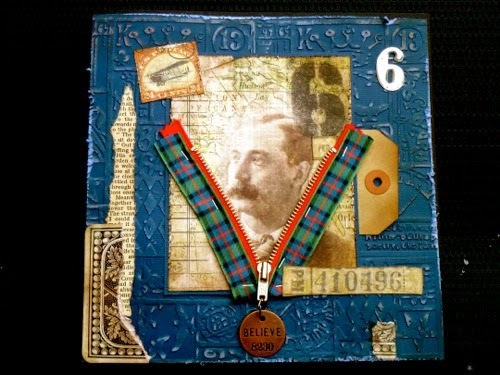 This started life at the 'Stitches' trade show last weekend in Birmingham using DecoArt products (it was disappointing there was no-one there this year using Tim's products) but I came home inspired to add my Tim things which totally transformed it. 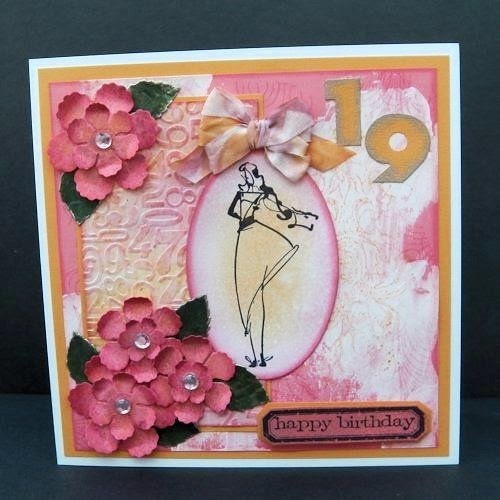 Some added die-cuts, distress paints and idea-ology elements and I'm happy. I did in fact create a fabulous effect on the oval die-cut that I am calling layered marble using distress paints, so keep your eye open for a tutorial coming soon. Well it's almost the end of our first challenge year - can you believe it? I don't know where the year has gone, but we say sorry goodbyes to Jools and to Trace and wish them both the best of luck as they progress their personal journeys in different directions. In two weeks time it will be our first birthday and we are starting the new AVJ year with some changes and a special challenge. There will be four prizes to be won including some special donated prizes as well as a £20 voucher from our ever generous sponsor Country View Crafts. Do keep the date in mind - the 6th March and pop over then to see what surprises we have in store for you. In the mean time we look forward to seeing you join us over the next two weeks. Wonderful projects from the team as always. Way to go ladies. Stunning work from all the design team - love this theme - be back soon - looking forward to March 6th too ?????? I love projects with numbers! These are all amazing as they always are. Loving seeing the AVJ pop to the top of my list. It always means amazing creations! Sorry to see Jools and Trace move on. But new adventures await for them I'm sure. Lovely works to see here from the design team and a wonderful challenge to play along! What wonderful creative projects using numbers from each of the Creative Guides! 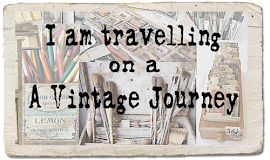 Just popped over to everyones blog. Fab tutorials Teamies, with great inspiration. Looking forward to seeing our challenge entries. Good luck to everyone entering. Fantastic projects ladies, I just love being part of this fantastic team!! Will try and visit everyone before the weekend is out.... Can't wait to get a closer look! Linky there now, thanks for letting us know - my fault lol. I am so loving all these "Special Numbers" and can't wait to check out all the details! Such a talented group! Hugs! I finally found time to play with you again...as always is DT work amazing; I love every single piece...thank you for the great challenge!! Great inspiration from you all, ladies! Thank you for the wonderful challenge! Brilliant work by the Design Team again! Thanks for the fab challenge! Wow! Look at these projects! All of them are stunning and vastly creative. 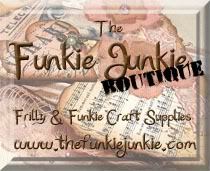 I can't wait to get up tomorrow morning and start visiting the blogs! Awesome work, ladies! And what a fun challenge, to boot!